Comedian Daniel Tosh will be performing in Washington, DC at the Warner Theatre on Friday, Nov. 5th. Show starts at 7:30 pm. Tosh kicked of his Tosh Tour Twenty Ten at the Tuscon Music Hall on on September 24th 2010 in Tucson Arizona. Daniel Tosh tickets are in big demand follow the success of his hit Comedy Central show Tosh.0 which showcases internet video clips from around the world. 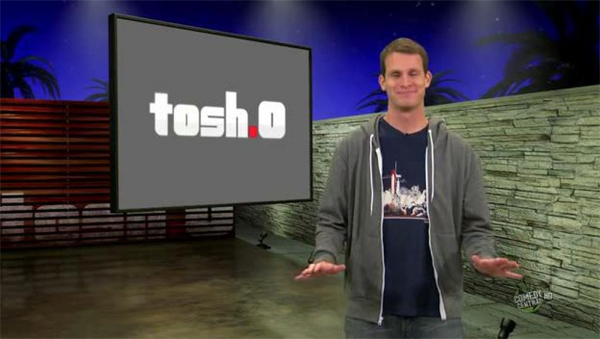 Tosh.0 is currently the most watched show on Comedy Central beating out hit shows such as the Daily Show with Jonathan Stewart and the Colbert report. Tosh.0 is averaging over 2.2 million viewers and Daniel Tosh is quickly becoming one of the hottest comedians in the country. Daniel Tosh has been a stand up comic since 1998 when he appeared as one of the “New Faces” at the Just for Laughs Comedy Festival in Montreal. Since then, Mr. Tosh has appeared on Taco Bell commercials, the Tonight Show with Jay Leno, Late Night with David Letterman, Jimmy Kimmel Live, Comedy Central’s Premium Blend, and the Mike Myers movie “The Love Guru”. In addtion Daniel Tosh has also had 2 Comedy Central specials- Comedy Central Presents Daniel Tosh and Daniel Tosh: Completely Serisous. Not since Dane Cook first broke out have tickets to a comedy show been in such big demand.